"I experimented for years to come up with a brownie made with matzoh... this is the best!" In a large mixing bowl, beat the eggs and the sugar together. Add the oil. Mix in the cake meal and the cocoa. Add nuts, or use the nuts as a topping. I put nuts on top rather than in this cake for two reasons. They make the top look good without having to frost it. Also, for those who don 1t or can 1t eat nuts, they are easily removed without having to search for them. Pour batter into a greased 9 x 13 inch pan. Bake at 325 degrees F (165 degrees C) for about 35 minutes. The secret to a moist brownie cake, Pesach or otherwise, is to underbake it. Check it at about 30 minutes. Fast & easy to put together. 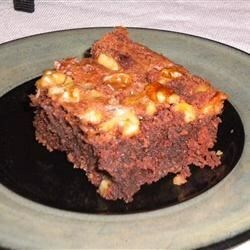 A delicious moist and chewy brownie. I didn't change a thing. Brought these in to work today and everyone loved them! Great recipe. We ran out of oil and substituted 1 cup melted margarine instead; it made the brownies even moister and cake-like. A dinner guest made this for me. It was AWESOME. It will definitely be made again next year !!!!! Nice and moist and rich chocolate tast.